The ingredient list is short, the prep is simple and the ferment is short while the shelf-life is long. Other than a pot of sauerkraut I made circa 2010 and a few unplanned projects involving jugs of apple cider stored and forgotten in the dorm fridge in my basement, I’ve not dabbled much in DIY fermentation. I love kimchi, kvass and kombucha; lacto-fermented pickles of all sorts; soy, fish and Gochujang sauces; and cultured buttermilk, kefir and skyr. But I generally buy all of the above from experts who have the technique, time and temperament to wait for the right types of bacteria to force bubbles to break the surface inside a fermentation crock. That said, I am forever on the prowl for simple ways to preserve both woody perennial herbs like oregano, thyme and rosemary and leafy annual ones like basil, parsley, dill and cilantro before my locally sourced ones die off for the winter. I’ve dried and frozen them, encased them in oil inside ice cube trays and stuck them in bottles of vinegar. This year, though, I am fermenting them for a whole host of reasons. The ingredient list is short (herbs, salt and water), the prep is simple (combine said herbs, salt and water), and the ferment is short (just five to 10 days) while the shelf-life is long (several weeks at room temperature, two to three months in a root cellar or up to six months in the fridge). In the end, I get two culinary products. Herbs that taste like a slightly tangier version of themselves to use in all sorts of dishes (like Turkey Meatball Soup with Fermented Herbs; see recipe) and an herbaceous brine that goes well in vinaigrettes, mayonnaise and bread. According to Shannon Stonger, author of “Traditionally Fermented Foods,” there are two methods for fermenting herbs: the chopped paste method; and brine-fermented fresh herbs, where the leaves are left whole. You really only need to use a little of these herbs at a time, so smaller jars are best to avoid waste. I still stick the stems of the herbs into a bottle of vinegar to provide flavor and prevent waste on that front, too. 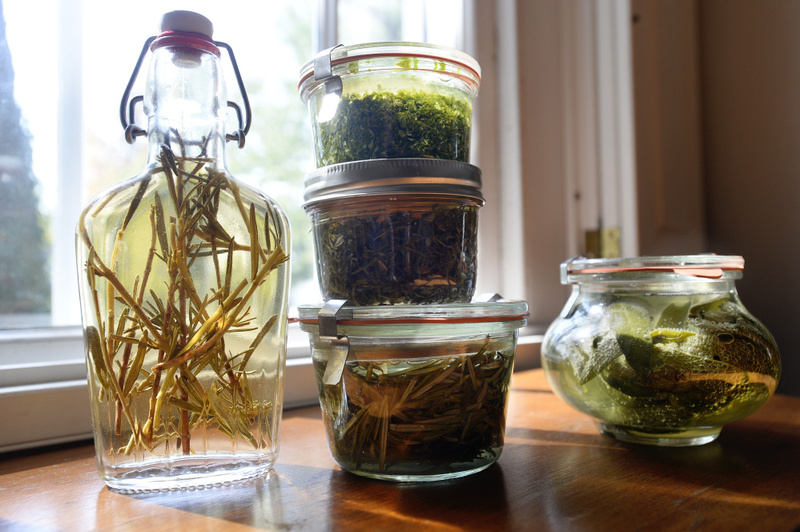 For the brine-fermented fresh herbs, pack a sterilized 8-ounce (237-ml) class jar with herb leaves (either a single variety or any mix you particularly fancy) that have been pulled from their stems, leaving about 1/2-inch of headspace. Next, dissolve 1 teaspoon of Maine sea salt in 8 ounces unchlorinated water and pour the resulting brine over the herbs, again leaving about 1/2 inch of head room. You’ve got to weigh down the herbs so they stay submerged in the brine during fermentation. You can buy weights for this purpose. But since I don’t own any, I used wide-mouthed mason jars to hold the briny herbs and nestle smaller glass tops from Weck jars into the mason jars to do the job. To employ the chopped-paste method, remove the herb leaves from the stem as before, but chop them finely. Transfer the chopped herbs to a small bowl and for every 1/2 cup of herbs, stir in 1/2 teaspoon Maine sea salt. Transfer herbs, salt and any brine in the bottom of the bowl to one or two 8-ounce (237-ml)-size jars, as needed. Pack them down tightly and check the level of the brine. If it hasn’t come up above the level of the herbs, create a strong salt brine (1 teaspoon Maine sea salt to 1/2 cup unchlorinated water) and add it to the jars until the brine just covers the herb paste. Place a weight on top of the paste. With the weights in place, cover the jars and let them sit on the counter to ferment until the contents of each are bubbling and tangy, between 5 and 10 days, depending on the herb. Some herbs – especially basil – will oxidize and darken. Those are still safe (and delicious) to use. Once fermentation is complete, transfer the jars to cold storage, where the only thing left for you to do is to remember to enjoy them. As they sit in the brine, the fermented herbs mellow while the brine’s herby flavor strengthens, so taste both before stirring them into dishes. Like many things fermented, fermented herbs are widely used in Eastern European cuisine. 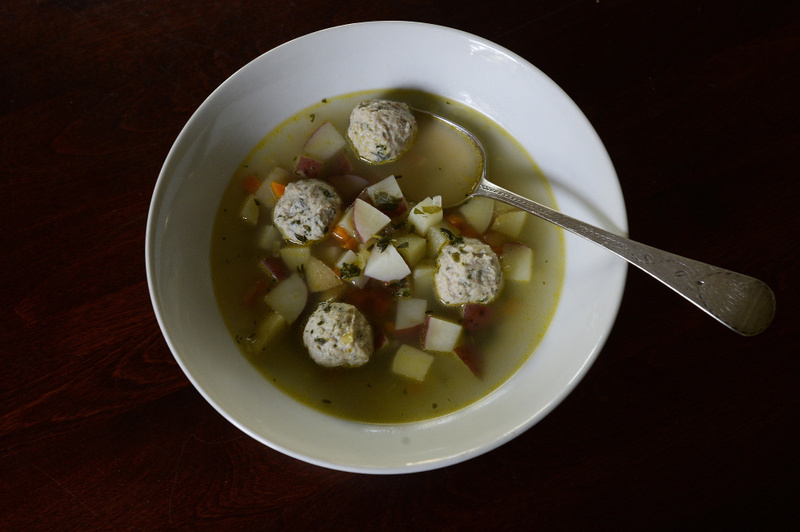 Frikadelki is a Russian or Ukrainian soup for which small meatballs are gently poached in a root vegetable broth flavored with fermented parsley and thyme. Grate the sweet onion into a large bowl. Add the ground poultry, 2 teaspoons of fermented parsley, 1 teaspoon fermented thyme leaves, and pepper. Use your hands to gently combine all of the ingredients. Form the mixture into approximately 36 (1/2-ounce) meatballs, about the size of a walnut. Heat the butter over medium heat in a large pot. Stir in the diced onion and carrot. Cook, stirring, until softened, 5 minutes. Add the potatoes, broth, 4 cups cold water and bay leaf. Bring to a boil. Reduce the heat to maintain a steady simmer and cook for 5 minutes. Gently place the meatballs into the simmering broth, and cook until both they and the potatoes are tender, about 10 minutes more. Remove and compost bay leaf. Stir in the remaining 1 teaspoon of fermented parsley and 1/2 teaspoon fermented thyme, plus 1 teaspoon brine from each jar. 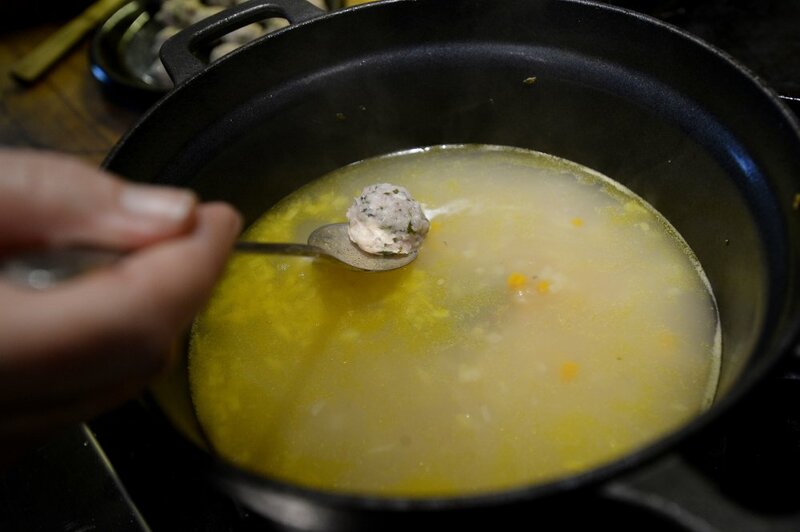 Divide the soup among 6 warm soup bowls and serve immediately.